WASHINGTON — Federal Reserve officials were worried about slowing economic growth abroad and the fading effects of President Trump’s tax cuts when they decided in March to pause interest rate increases and cut economic growth forecasts for 2019, according to minutes from the meeting released on Wednesday. The minutes showed that members of the Federal Open Market Committee judged consumer spending and business investment to be slowing in the first quarter of the year, and that they “generally expected the growth rate of real G.D.P. this year to step down from the pace seen over 2018,” which was 3 percent. Some Fed officials raised concerns that complications with Britain’s withdrawal from the European Union or the Trump administration’s trade talks with China could further hurt growth this year, and “a few” worried that high levels of debt corporations have taken on during the expansion could exacerbate a downturn in the United States. Officials showed little concern over the possibility that inflation could surge this year. After raising interest rates four times in 2018, Fed officials left them unchanged in March, citing subdued inflation and increased challenges to global growth. They surprised financial markets by releasing projections showing that the typical Fed official does not expect any changes to interest rates this year, down from the two increases that the Fed said it expected in December. And they announced a faster-than-expected end to the winnowing of the Fed’s giant portfolio of bonds, which it accumulated in an effort to stoke economic growth after the financial crisis. The Fed also reduced its 2019 growth forecast to 2.1 percent — a full percentage point less than what the Trump administration predicts for the year. Those revisions, along with muted inflation pressures, prompted most Fed officials to concur that interest rates would likely stay unchanged in 2019. “A majority of participants expected that the evolution of the economic outlook and risks to the outlook would likely warrant leaving the target range unchanged for the remainder of the year,” the minutes said. 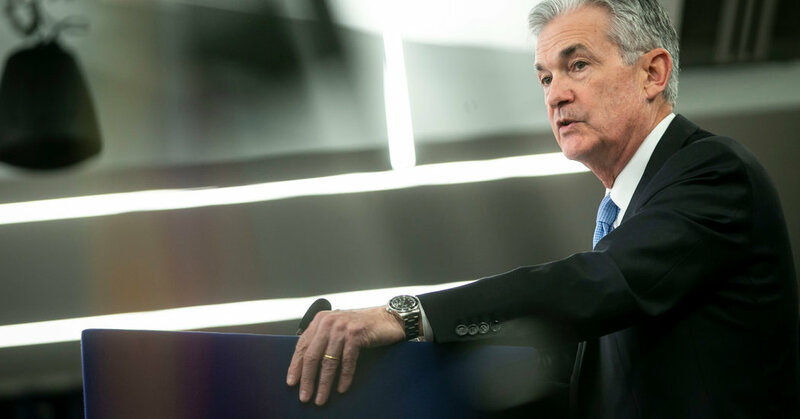 In a news conference after the meeting, the Fed chairman, Jerome H. Powell, called the domestic economy “strong” but said the Fed would be patient — and attentive to economic data — before deciding its next move on interest rates. “Data arriving since September suggest that growth is slowing somewhat more than expected,” he said. Mr. Powell is under intense pressure from Mr. Trump to keep interest rates low and take new measures to stimulate growth. On Friday, Mr. Trump called for the Fed to cut rates and to resume its bond-buying program to goose the economy. The president has previously criticized Mr. Powell for the Fed’s rate hikes, which he said slowed economic growth, and has expressed frustration with his Treasury Secretary, Steven Mnuchin, who recommended the Fed chair to Mr. Trump. At an event held at the International Monetary Fund on Wednesday, Mr. Mnuchin defended Mr. Powell and praised him for making interest decisions based on economic data. He also weighed in for the first time on Mr. Trump’s plans to nominate Herman Cain, a former businessman and Republican presidential candidate, to the Fed, along with one of his economic advisers, Stephen Moore. Mr. Mnuchin said that while he disagrees with Mr. Cain’s call for a return to the Gold Standard, he believes that both Mr. Cain and Mr. Moore would be good members of the board. And he dismissed criticism that the president was trying to interfere with the Fed’s independence by choosing political allies for the seven-member Fed board. Republican senators expressed concerns this week about Mr. Cain, whose White House run was derailed by multiple allegations of sexual harassment from several women. Asked on Wednesday if Mr. Cain’s nomination was safe, Mr. Trump offered only a limited vote of confidence.